What type of waste does the transfer station accept? We accept household trash (including but not limited to batteries, light bulbs, computers, tv's) except for household hazardous waste. We accept sorted waste including; glass, plastic #1's and 2's w/o lids, cardboard, mixed paper, aluminum , steel, wire, wood, sheetrock (clean), wood (dimensional lumber, 2x4s, floor joists, plywood/OSB), rocks, concrete, masonry, soil (clean), logs, stumps, untreated posts, manure, green waste (grass and yard trimmings), used motor oil, cell phones, iPods and MP3 players, digital cameras, PDA's and Palm Pilots and small printer inkjet cartridges. We accept construction and demolition debris. We accept tires. Where should I take my household hazardous waste? Teton County Wyoming will accept household hazardous waste during the months of April - October by appointment only. Please call Teton County Wyoming (307-733-7678) for details about their household hazardous waste program. 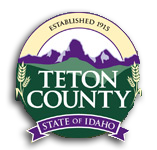 Teton County Idaho will reimburse up to $150/year to their residents with a receipt from Teton County Wyoming. What should I do with the paint that I don't need anymore? The transfer station can accept latex paint if it is dry. Kitty litter, sawdust, dirt and other similar products can be used to dry paint. Oil base paint is considered a household hazardous waste and should be taken to Teton County Wyoming household hazardous waste facility. Why do you stockpile recyclables? Solid Waste inspects, decontaminates and bales cardboard, paper, plastic and tin cans. Because of our remote location it is not cost effective to constantly haul small amounts of recyclables offsite. We store them until we have enough to make hauling them worthwhile. Why do you charge more for refrigerators, air conditioning units and tires? The additional cost on refrigerators and a/c units for proper refrigerant recovery and disposal cost. Tires are a fire hazard and also problematic for most landfills due to the fact they float to the top even after being buried; therefore tires must be sent to tire recycling centers that find alternative uses fo old tires. The cost to properly dispose/recycle old tires is continually increasing due to the specialized equipment used in the process as well as the location of the tire recycling center being so distant from Teton County, Idaho. Why do I have to come across the scale if I'm only recycling? The transfer station is required to track all materials received and leaving the tranasfer station site per Idaho Department of Environmental Quality, Eastern Idaho Public Health District and the operation plan that was approved by the previously mentioned entities as well as Teton County Board of Commissioners. Tipping Fees are more accurate if they are based on weight. Weighing materials allows better tracking of materials and their end destination as well as assists in forecasting budgets for future fiscal years cost of operations and disposal costs. Why do you close at 3pm during the week and 1pm on Saturdays? Extending Hours of Operation at the transfer station would require additional staff added to the schedule or current employees would accrue overtime. Teton County Policy allows overtime only when pre-authorized for absolutely necessary special events or in emergency situations. The hours of operation for the transfer station are based on annual budgets approved by Teton County Board of Commissioners based on 40 hours per week per employee. Does the county provide trash pickup services?